There’s no getting around it. If you have an internet business these days, you need to have an effective “funnel” to capture leads and keep a constant stream of potential paying customers coming in. 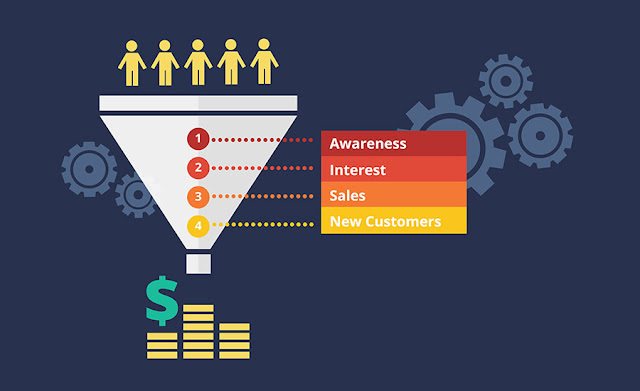 A well-designed funnel builds a solid relationship with your prospects and engages them with your company … enough that they turn into paying customers. The largest number of people are those who click on an ad (or some other part of your marketing campaign) and are taken to your landing page or website. Fewer people submit their email address to you so you can send them free information, as well as marketing messages. Even fewer buy your “front end” (lowest cost, introductory product — like an e-book). And fewer still go on to buy your more expensive “back end” products. The fact is, with a funnel you can’t expect 100% of the traffic to your website or landing page to turn into a customer. It sounds horrible, but it’s actually okay. More than okay. Because even if a small percentage of people go all the way through your funnel, you can still be very profitable as those people are spending a good amount of money on your products. In fact, you’re counting on only a small percentage of your traffic turning into customers. That’s just how internet marketing works. But because this is the case, it’s important that you keep large amounts of new people coming into your funnel all the time. The fewer people who enter your funnel, the fewer come out the end as customers. It can’t stagnate. So that means constantly refining your marketing approach and keeping an eye on your traffic.If it starts to dip, it’s time to tweak or change your marketing campaign or advertise in a new place. The great thing is that once you have your marketing funnel in place, it runs on autopilot. Leads come in and are converted into customers without you actively having to do anything. You should be monitoring the funnel closely to make sure it’s all working and that your numbers aren’t slipping. But other than that it’s money while you sleep. The first step in creating your funnel is to drive traffic. Your goal is to get them to a landing page or your website. You can draw prospects into your funnel from a variety of free and paid sources. On the free side you have social media posts on social networks like Facebook and Twitter, blogs, YouTube videos, and content websites that draw the attention of search engines and as a result a lot of traffic. These traffic drivers are very cost effective. And because they are content-oriented, they tend to be more effective at getting your prospect to take action. For paid traffic drivers to your funnel you have pay per click ads via search engines like Google, paid social media ads (like sponsored posts on Facebook), and banner ads.It’s important to watch how much you spend on paid efforts. Make sure it’s effective, and you’re getting numbers you need before rolling out a full campaign. In all cases, you need compelling web copy to capture your prospect’s attention; a headline on your ad that draws the eye, for starters. All your copy must be benefit-oriented — the prospect should know how the product you are promoting will change their life. You also want to create curiosity. Don’t give them the whole story — leave them wanting more. Finally, you also need a call to action. You have to tell the prospect what to do to find out more. When they click, they enter your funnel. Free Report on the latest scientific diet breakthroughs from Harvard. Recent study shows there are three foods that make you fat no matter how much you exercise. Go here for all the details and to get your Free Report. Do you see how that ad has a compelling headline, offers benefits to the reader, uses curiosity, and finally give a very clear call to action? Read more about three proven ways to market your business on the internet. Once you have a steady stream of prospects coming into your landing page or website, you want to capture those leads. Or, if your business lends itself to this type of offer, you could even include a free trial for your service, say seven days or even 30 days. Essentially you’re giving your potential customer a sneak-peek. This will speed up the process of getting them to know, like, and trust you, which is essential to turning them into a buyer down the road. For that reason, the freebie or trial offer should be valuable and packed with useful goodies. Don’t worry about giving stuff away - it’ll more than pay for itself when you take on a new customer. The freebie offer is so important that it’s a good idea to have a landing page that is simply about offering a valuable free report or some other item in exchange for their email is so powerful. You don’t necessarily want to send them to your main website — it could be too distracting. Although if you do, you want to make sure your freebie offer is shown prominently. Once they’ve signed for your list, that sends a powerful signal they are interested in your products or services. It’s important that you use a program like InfusionSoft or AWeber to keep track of your email list. This will make it easy for you to send messages to your list — mass mailings at the click of a button. But you’ll also be able to see who buys and who doesn’t, who clicks on your emails and who doesn’t. You could even send customized marketing messages to different parts, or segments, of your list. Once your list grows this ability to customize messages will be invaluable. So it’s important to start off right with one of these email services. Explore five ways to add email subscribers to your email list. Now that you have a growing list of emails from prospects, it’s time to turn them into customers. But you have to approach this with finesse. You can’t just barrage them with sales messages. You can’t “spam” them. You have to strike a balance between valuable free information, tips, strategies, or whatever else that they can use and advertising: marketing messages, product offers, etc. There are a couple of different approaches here and it’s important to consider which one is right for you. Some marketers send out a newsletter by email. Others send a simple email with a useful nugget. You have to figure out what your audience would like to see. The basic idea is that you have to build a solid relationship with your prospect. You do that by giving them plenty of free stuff, enough that eventually a percentage of those people will be ready to buy a paid product from you. That first product is called a “front end.” It’s low-cost, which makes it more likely the prospects will buy it. A low barrier to entry, in other words. Your marketing efforts to new folks on your list should be towards buying a front end product. You’re not going to make a ton of money on a front end product. In fact, you should be happy if you break even. But the whole point is to make your prospects into paying customers — as many as possible. Once they do that, they’re more likely to buy higher ticket products later. So what do you offer as a front end? It could be a monthly email newsletter for $29 a year. Or an ebook for $19. Remember, you just want to get them into the front door, so to speak. Your product still should be valuable. You want to overdeliver so that your front end customers continue to think highly of you. That helps you prime them to buy again down the road. That means, of course, you don’t stop marketing to these front end buyers. But instead of sending them offers to buy a front end product, you now step up the game. But as you do that, don’t forget to keep sending them valuable free information in the form a free letter, articles on your website, or some other source. Another option is to promote information products as an affiliate if you don't have your own products or services to promote. If you need more ideas, here are five simple ways to make money online. Once you have prospects in the door and they’ve bought a front end product, now it’s time to sell to them again. And this is where you make your money — with back end products. Back-end products should be related to your front end product and be in your business’s niche, of course. Going back to the organic gardening example, say your front end product is a monthly newsletter that goes out by email with gardening tips, interviews with experts, etc. Your back end product could be a series of books showing organic gardening planting techniques. You could sell it for $99. The next level up could be an in-depth course with videos and printed guides, on a membership website, showing gardening techniques but also including a forum for asking questions and networking. The price point could be $299. Taking it to an even higher level, you could have a conference a few times a year at an organic farm where you offer workshops and guest expert speakers. You could sell that for $899. All are hypothetical examples. But you get the idea how there is a progression from low-cost front end product to back end products of increasing prices. Explore more about how to start an online business and make money online. Not all of those people who join your email list will buy a front end product, and decreasing numbers will buy the higher-priced back end products. But that’s the nature of a marketing funnel. And why you must keep a steady stream of prospects starting their journey through the funnel. In the end, it all works out as that relatively small numbers of buyers spend enough to keep your profitable, and then some. Sales funnels are one of the most effective ways to build an online business. Best of luck with yours.